A new definition of desperate times: Even as the government threw a stunning new $30 billion lifeline to American International Group on Monday, the beleaguered insurance giant confirmed it had lost more than twice that much, $62 billion, in a single three-month period. And many more billions of federal dollars are almost sure to be shoveled into the company for a simple reason: Officials fear its collapse would cripple financial markets in the U.S. and around the world. The source of trouble for AIG, which has 74 million customers worldwide and operations in more than 130 countries, is its business insuring mortgage-backed securities and other debt against default. That business imploded once the credit crisis struck with force. If it's such a money drain, why keep AIG afloat at all? Because AIG is at the hub of the global financial system - insuring pensions, money markets, banks and insurance companies against losses in 130 different countries, reports CBS News correspondent Nancy Cordes. If AIG fails, the whole wheel could deflate. "The president understands that he will take the steps necessary to ensure there is not a catastrophic failure to our economic system," said White House press secretary Robert Gibbs. AIG is so big and sprawling, so intertwined with institutions around the globe, that its downfall could set off a vicious chain reaction. Upheaval on such a global scale would plunge the U.S. economy deeper into recession, drive up unemployment and stifle hopes for an economic rebound any time soon. The company provides life, property and other insurance offerings, with 30 million policyholders in the United States alone. It also provides asset-management services and airplane leases. Its International Lease Finance Corp., which leases jets to airlines, has been up for sale and was thought to be one of the insurer's jewels. But falling travel demand has forced airlines to shrink fleets. AIG's businesses also are linked to mutual funds, annuities and other retirement products held by many Americans. "Given the systemic risk AIG continues to pose and the fragility of markets today, the potential cost to the economy and the taxpayer of government inaction would be extremely high," the Treasury Department and the Federal Reserve said in a joint statement Monday. AIG's $61.7 billion loss reported Monday is the largest since Time Warner Cable's $54 billion drop in 2002, reports CBS News correspondent Priya David. Turning AIG into a smaller, more viable company, "will take time and possibly further government support," the Treasury and the Fed acknowledged. Indeed, many analysts say the United States will eventually be forced to funnel billions more into the company, which the government seized control of last year. And they say AIG has become a seemingly bottomless money pit that poses a cautionary tale about the effectiveness of U.S. bailouts. Mark Williams, professor of finance and economics at Boston University and a former Federal Reserve bank examiner, said he thinks at least $200 billion more will have to be extended to AIG. 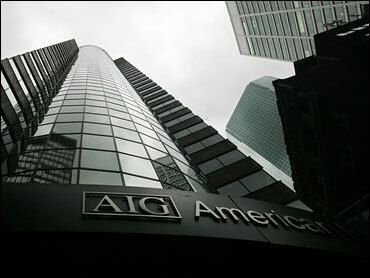 "AIG is holding the U.S. government hostage at gunpoint," Williams said. "The government can't cut its losses because it is too far into AIG. It has no choice but to keep on pumping money into the company." Said Terry Connelly, dean of Golden Gate University's Ageno School of Business in San Francisco: "If AIG fails, the taxpayer wearing his or her other hats - the worker, the student loan payer, the car buyer, the homeowner - will suffer even more." "What's going on now is the government is shifting from a tough-love lender to a little more friendly equity investor," Connelly said. At the White House, press secretary Robert Gibbs said, "We're focused on taking the steps necessary to restructure AIG so that it, in the long run, no longer poses the type of systemic threat that it poses right now." Under the new deal, the government revamped its rescue package, saying it will give AIG an additional $30 billion money on an "as needed" basis. AIG's bailout now totals around $173 billion. The American public already is angry about using taxpayer money to bankroll a string of big financial company bailouts - including Citigroup, Bank of America and mortgage giants Fannie Mae and Freddie Mac. Lawmakers also have expressed skepticism over the rescue strategies of the new Obama administration. "There are still too many unanswered questions about how AIG spent" some of the rescue money the government has already put up, said Rep. Elijah Cummings, D-Md., a member of the House Committee on Oversight and Government Reform. Doubting investors have cut the company's share price to 45 cents. that it hoped to sell to repay the government. As of Feb. 13, AIG had sold interests in nine businesses. The additional $30 billion credit line AIG received Monday will come from the government's $700 billion financial bailout pot. In an interview on NBC's "Today" show, AIG Chairman and Chief Executive Edward Liddy said: "The new $30 billion is a standby line. It's not necessarily something that we think we'll have to draw on right away." But Liddy, who joined AIG after its initial bailout and is being paid an annual salary of $1, backed off earlier statements about paying back taxpayers in full within two years. The government announcement came as AIG, once the world's largest insurer, reported it lost $61.7 billion in the fourth quarter of last year, the biggest quarterly loss in U.S. corporate history. The revamped package also reduces interest payments AIG has to pay on government loans. The Treasury will exchange its existing $40 billion in AIG stock for preferred shares with revised terms that more closely resemble common equity.